탱화란 천이나 종이에 불화를 그려 족자나 액자형태로 만들어 거는 그림인데, 이 탱화는 종이나 비단이 아닌 나무를 조각해서 만든 목각탱이다. 이 목각탱은 가로 236㎝, 세로 226㎝, 두께 10∼12㎝로 비로자나불을 모시는 보광전의 후불탱화로 사용되고 있다. 길쭉한 나무판 8장을 연결하여 연꽃 위에 앉아있는 본존불을 중심으로 좌우 4단씩 3열로 10대보살과 10대제자, 사천왕을 계단식으로 배치한 독특한 구조를 보여주고 있다. 보살상들은 모두 머리에 보관을 쓰고 꽃가지를 들고 있으나 한 분만 합장하고 있으며 관음과 대세지 보살은 연꽃 위에 앉았고 다른 인물들은 서거나 무릎을 꿇고 있다. 각 인물들 사이에는 연꽃과 꽃봉오리 등으로 장식하였고 가운데 있는 본존의 머리 위에는 상서로운 구름이 솟아올라 2줄기로 갈라져 있다. 몸에 비해 큰 방형의 얼굴은 앞으로 약간 숙여 사바세계를 굽어 살피듯 평담하게 묘사되었다. 명문이 남아있지 않아 정확한 연대는 알 수 없으나 조선 후기 불화의 특징이 잘 나타나 있는 작품으로 회화적이면서도 조각적인 매력을 간직한 귀한 작품이다. In a Buddhist sanctum, the wall behind the principal Buddha statue is usually adorned with a scroll or a frame of a Buddhist painting drawn on cloth or paper. 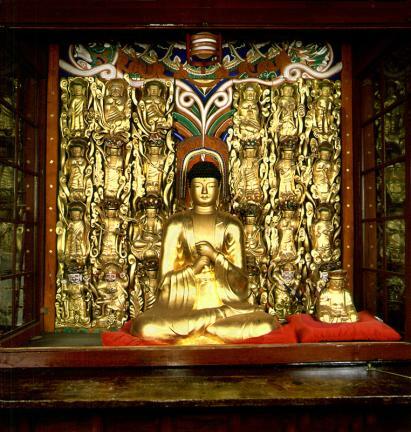 Note, however, that Bogwangjeon Hall of Namjangsa Temple has a unique piece of art on its wall: a wooden sculpture representing various religious figures. This altarpiece, measuring 236 cm wide, 226 cm long, and 10-12 cm thick, is hung behind the statue of Vairocana Buddha. Vairocana Buddha is sitting on a lotus flower at the center, with ten Bodhisattvas, ten disciples, and Four Guardian Kings arranged in three columns of four rows on both sides. All Bodhisattvas are wearing a jeweled crown and holding a spray of flowers, and only one Bodhisattva has his hands clasped. The Avalokitesvara and Mahasthamaprapta Bodhisattvas are sitting on a lotus flower, whereas other figures are standing or bending their knees. The spaces between the figures are decorated with lotus flowers and buds, and two lines of auspicious clouds are sprouting above the principal Buddha. The face of Vairocana is square and rather big compared with the body. There is no way of finding out exactly when this altarpiece was made because no inscription has survived, but it displays the typical characteristics of Buddhist art during the late Joseon Period.